Ever wanted to see a sewage suction tanker explode and all the liquidy shite inside it spray everywhere? You've come to the right place, pal. Yes, look at this video and all its filthy, hilarious glory. 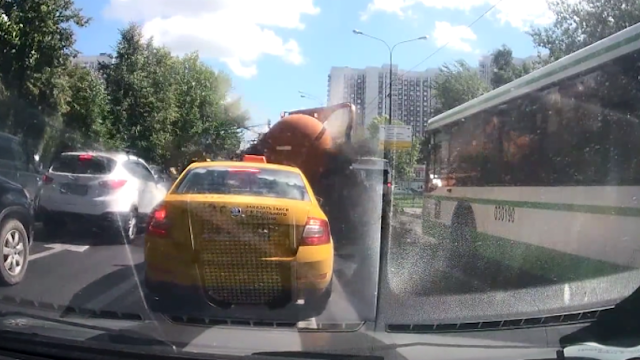 The dash cam footage, shot in Moscow near the Altufyevo subway station, shows a sewage truck pull up in traffic only to implode seconds later, spraying - if not coating - whole sides of nearby cars, taxis and buses. It is in every sense of the word, a shitstorm. The person shooting the video looks to have gotten away undirtied by the nuclear stool extravaganza. It is unknown whether the driver is suffering from the visual memory or smell. I guess not. They probably just skipped tea that night.